MOSCOW, May 24 (Itar-Tass) -- Patriarch Kirill of Moscow and All Russia will lead the church part of the celebrations on Sunday to mark Slavic Written Language and Culture Days. The patriarch will lead a liturgy in the Assumption Cathedral in the Moscow Kremlin in honour of Saints Methodius and Cyril, enlighteners of Slavic peoples. The Slavic holiday is marked on the day of the memory of the saints. Patriarch Alexy II started the tradition of church celebration in Moscow. A religious procession formerly went from the Kremlin to Slavyanskaya Square to the Cyril and Methodius monument. This year, the procession will go to Red Square at the end. The patriarch will lead a short church service in the presence of state power representatives, and then a festive concert will take place there after the patriarch's address to the meeting. Some regional city was chosen formerly as a capital to mark the days, but the organising committee has decided to hold the main celebration in the Russian capital from next year. The ambassadors of eleven Slavic states will lay flowers at the monument to Cyril and Methodius on Sunday morning. The same day, a ceremony will be held at the Donskoi Monastery where are the graves of Russian emigrants -- writer Ivan Shmelev, philosopher Ivan Ilyin and general Anton Denikin. The next day, on May 25, the patriarch will lead the ceremony to present International Saints Cyril and Methodius Prize awards in the assembly hall in the Cathedral of Christ the Savior. A concert of the festival of Slavic arts will take place there after the ceremony. 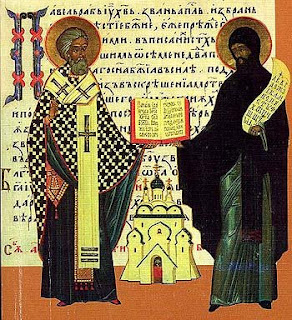 The Moscow patriarchate and the Russian Slavic Foundation award the prize beginning 1997 to state and public figures, writers, artists and musicians for contribution to the maintaining and development of the heritage of Cyril and Methodius. A bronze sculpture representing Cyril and Methodius, a diploma and a medal are presented to those awarded.